Materials: Jasper, Jet and Burgandy chips. 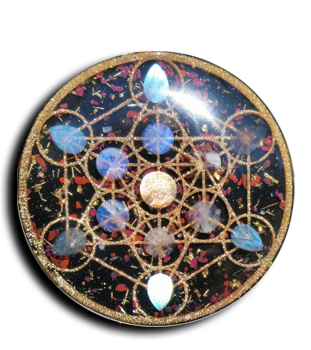 It contains 23.5K Gold Leaf with Quartz and Noble Shungite, Turquoise and Brass shavings; one Sunstone, 6 Moonstones and 6 teardrop Labradorite cabochons. Embodying this symbol opens doors of perception to deep and profound levels of self discovery.